The Hoe Stream bisects the park, crossing present day Old Woking Road at Hoe Bridge and leaving the park on its way off the map to Newark Lane. There are three marked gates to the park, Towne Gate at the right angle bend where the park meets Woking High Street, Heath Gate at the top of the map and Pyrford Gate at the south of the map at its most easterly extremity. There are two perceivable trackways both originating from Woking Palace at the bottom of the map. The paths diverge just north of the Palace site, one branch going westwards to Towne Gate and the other east to Pyrford Gate. Just after the Pyrford path has crossed the Hoe Stream and turns to the east, there is a branch which continues north to the Lodge. There is no marked path to or from Heath Gate. The Little Park is at the bottom south west corner of the map and is marked: The game come not into this. The River Wey forms the southern boundary although the paling is slightly to the north of the river bank. Field divisions are shown and nestling in its south east corner is Henry VIII’s Woking Palace with its surrounding moat. There is no sign of the middle arm, this having been partly filled in about 1580 but the map also omits the stunted remains of the arm visible today. Present day Woking Park Farm is probably to the east of the Palace site. Note too the fields to the east of the farm. The Great Park comprises the remainder of the map. It is separated from the Little Park by what appears to be a long ploughed field probably evidence of the greater fertility of the smaller park. A path leads from the Palace along the north of this field to the Towne Gate. The area between the path and the Hoe Stream is known as Towne Lawne. 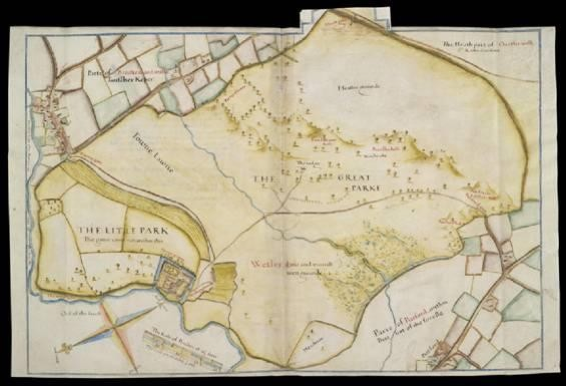 Also within the Great Park there is another area towards the River Wey described as Wetley Low and moarish wett grounde. This is probably wetland and the remains of a medieval river farming system can be seen near there today. Below the wetland, still within the park, there is a triangular area paled on two sides and described as Meadowe. The boundary of the park did not follow the line of what is now Old Woking Road and there is no sign on the map of White Rose Lane. From just before Hoe Bridge the paling of the park turns away from the road but then continues in the same direction. Within the park after Hoe Bridge, there is a rectangular area bordered on three sides by trees and on the fourth by the park paling. This area is marked as Portes’s Corner in red. The part of the Great Park at the top of the map is described as Heathie ground. In addition, just above the Lodge there are some small hills highlighted in red as Fox borow hill, Burchehil and, Purforde ……… hill. The middle word of the last item is difficult to decipher, it looks like Lmllet but this is unlikely and there is already a Purford hill just below Purford Gate. This is a magnified extract from John Norden’s 1607 map of Woking Park. The River Wey can be seen on the left with the right angled bend at the bottom with Town Gate and the pathway from the Palace. The church is prominent in a rather stylised form from which it is possible to locate Church Street. Broadmead Road is also visible with its bridge over the river at the top of the map. There were obviously fewer houses then in the High Street than there are today and the houses shown are probably representations rather than exact images. However it is possible to identify the Old Manor House as the second house down on the right of the High Street of rather the Old Parsonage since the present day house was probably built on the in the middle of the 17th century. Almost opposite on the left hand side is the site of the Old Brew House with the ghost like white house, the present day house not having been built until the beginning of the 18th century. The house to the north of this is probably Moorhatch and the next house possibly Wellhouse Cottage, 102 High Street. 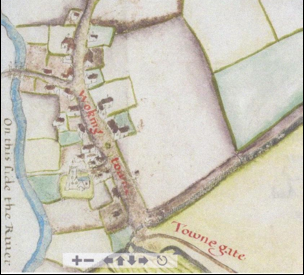 The large field at the bottom of the map is probably Botchers, item 300 and possibly also 301 on the Tithe Map.